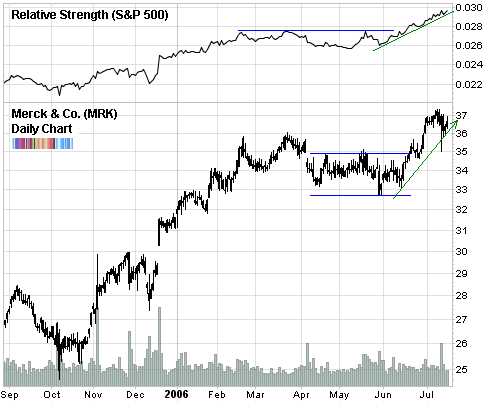 During April, May and June, while the general market indices were falling apart, Merck simply tread water. And by the middle of June it had actually begun to climb up, fighting against the current of the general market. Some other very high relative strength stocks in this sector are Astrazeneca (AZN), Abbott Labs (ABT), Eli Lilly (LLY), Johnson & Johnson (JNJ), and Schering AG (SHR) [being taken over by Bayer]. Take a look at their charts and you’ll see very similar outpeformance relative to the market. Hey Babak, are you sure this is a weekly chart? Is this from Stockcharts.com? How do you add the relative performance on top of the chart? Eyal: nice catch! you’re right it was a daily which I mislabelled. Yes, the chart is from stockcharts.com. To see relative performance, go to the bottom where it says indicators, use price and put in symbol:index (colon means divided by) and then choose the pane above - you can also put it below or behind.